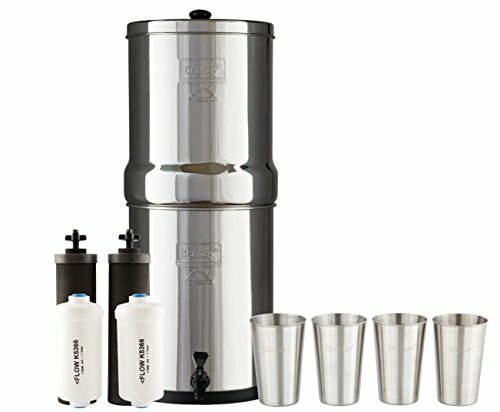 BOROUX BUNDLE INCLUDES 1 Royal Berkey Water Filter System with 2 Black Purifier Filters Bundled with 1 set of Fluoride Filters (PF2) & 1-SET OF 4 Boroux 12 oz Stainless Steel Cups to drink the best tasting water. Four (4) total Berkey Filters - 2 Black Purification Elements & 2 (White) Fluoride Filters. BERKEY FILTER PURIFICATION ELEMENTS ARE THE MOST POWERFUL FILTERS using gravity available, & provide the best value, at less than two cents per gallon, so cheap! The Black filters remove harmful viruses & bacteria & keep helpful healthy minerals. Compared to bottled water Berkey Filters Berkey water is cheap, & tastes better. Long lifespan of the 2 Berkey Black Filter filters is 6,000 (3,000 ea) of the cleanest best tasting pure water. They last for years. BERKEY FLUORIDE FILTERS PF2 Berkey Fluoride Filters remove up to 95% of fluoride from water. Berkey PF2 filters attach to bottom of Berkey Black filter in bottom chamber of Berkey Stainless Steel Water filter. Berkey pf2 Fluoride water filters remove fluoride from water already filtered by the Black Berkey Filters in top chamber. ROYAL BERKEY SYSTEM HOLDS 3 GALLONS of filtered water. It's perfect for 5-7 people & great for larger families and groups. Berkey Stainless Steel Water filter systems come in 5 different sizes. Stainless Steel Countertop Berkey Filters; Travel Berkey 1.5 gallons, Big Berkey 2.25 gallons Royal Berkey 3 gallons, Imperial Berkey 4.5 gallons & Crown Berkey 6 gallons of purified clean water. GET THE BEST TASTING WATER NOW Berkey Water Filter Systems provide the cleanest best-tasting water faster than refrigerator pitcher filters. Berkey Water tastes better than bottled water. Berkey water filters work with no electricity. ideal for survival, off the grid & camping usage. Each Berkey water filter system includes 2 black Berkley filters, easy to setup & easy to use.